"I've got a re-election coming up. I've been through a few elections commuting from Searchlight and it's hard," the 74-year-old senator said. "This will make that part of it much easier." "Landra and I love Searchlight, the place of my birth, and the memories we have had there, but the time came to sell and do something different," Reid said. "Searchlight will always remain my home, my favorite spot in the world where I can look at the desert for miles at end." When CNN's Chief Congressional Correspondent Dana Bash profiled Reid in 2007, she described Searchlight as a "dried up mining town, a relic of the wild west, a truck stop 55 miles from Las Vegas" where most of the 800 residents lived in trailers and "the one house belongs to the new Senate majority leader Harry Reid: shaped and scarred in Searchlight." Reid's father was a hard rock miner and a heavy drinker who took his own life. His mother did laundry for the 13 brothels in town to makes ends meet. There was no school in Searchlight so Reid hitchhiked to a school in Henderson, more than 40 miles away. "We made a decision, a year or two ago, that if an opportunity came along we would sell our property," Reid said. He pointed to "new technologies" that have brought "renewed interest in gold mining" to Searchlight as a reason he was able to sell. The Reid's sold their house, 110 acres, mining claims and mining and water rights to Nevada Milling and Mining. Separately, they sold two other mining claims in Searchlight to American Capital Energy. The total value of the sales is $1.7 million. The mines will bring 60 new jobs to Searchlight, Reid said. When they are in Washington, D.C., the Reids live in less humble digs: a condo in the Ritz Carlton property downtown. Standing in front of a cluster of trailer homes that sit on the property where his childhood home was, Reid explained to Bash seven years ago how he was able to escape the gambling and prostitution that dominated his beloved town and rise to the pinnacle of American politics. "Even though I was raised here, my mother was always able to instill in me, I was as good as anybody else," he said. He should have stayed in the desert. I hear the Ranch at Crawford,TX is For Sale. Don't need it as a prop anymore. Why no Ticker story on the rwnj's who killed those Las Vegas cops? What's that phrase Wayne LaPierre said? "The only thing to stop a bad guy with a gun is a good guy with a gun." Apparently in this case, that's been proven FALSE!!! He is very dirty old man . I wished he would travel or move to iran or syria he would fit in well there . 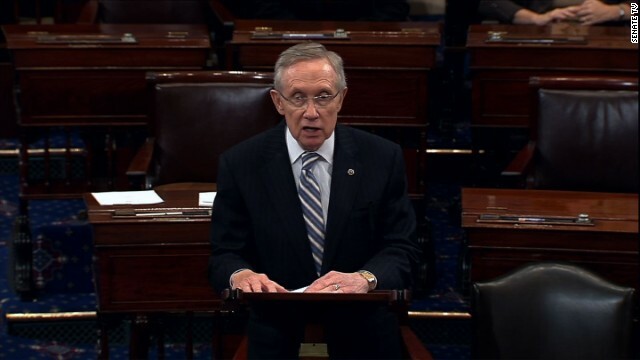 Senate Majority Leader Harry Reid born in Searchlight, Nevada. Ted Cruz born in Calgary, Alberta, Canada. Only one wants to be president ! Harry Reid knows what it is like to grow up poor and work his way out of those circumstances... unlike the country club brats aka GOP lawmakers who have had everything in life handed to them so they whine and cry when they don't get their way. Sadly most Americans can relate to Harry Reid's difficult childhood... except for GOP lawmakers, of course. These country club brats have had everything in life handed to them so they whine and cry when they don't get their way. Reid is as disgusting as they come. He can't be more detached. Why no Ticker story on the rwnj’s who killed those Las Vegas cops? What’s that phrase Wayne LaPierre said? “The only thing to stop a bad guy with a gun is a good guy with a gun.” Apparently in this case, that’s been proven FALSE!!! Dirty Harry is perhaps the most cynical, obstructive, mean-minded and lying politician these days. He is guilty of obstructing progress in the US Senate. Why is this old and probably senile man still the Senate Majority Leader? He makes up bombastic claims with nothing to back these with facts (remember Romney not paying any taxes). He has made personal business deals (real estate etc.) that are unethical and purely based on his position. No body seems to take him to task for his bad behavior. He is in no position to lecture others, when he himself is dirty and corrupt. His time is up. He will be retired and removed from leadership in November. Good riddance, dirty Harry! Ther is no way that man should ever be re-elected by the people of Nevada. That is simply the mindless at work, if it happens. You can say anything about a man you want, when one comes from hick town, such as Searchlight, not even a town, a Hundred miles from nowhere, and land up controlling the Senate, then kudos to him. The man is smarter than any one here attempting to belittle his achievements.. I spend my New Years there 50 years ago and it was the pits. I would not bet the farm on that upcoming election Harry. Oh, I forgot....you sold it. @criss-E..al, you are probably discribing Ronald Reagan, that looted this nation's arms, ammunition to Iran and set in Trickle down nonsense, Bush to two wars that drained national treasury. You talk republican garbage. These animals belong to Taliban. I like Harry Reid! Good for you Senator. ....His time is up. He will be retired and removed from leadership in November. Good riddance, dirty Harry! Since his term isn't up until 2016, this will be just one more of your "predictions" that will disappoint you. Whats wrong with yall man? its ah damn shame yall want change. it is what it is. deal with it. hell i do. Why no Ticker story on the rwnj's who killed those Las Vegas cops? Because they are busy trying to figure our how to paint them as liberals. There are multiple comments over at Fox making that claim right now. One can say anything about a man you want, when one comes from hick town, such as Searchlight, not even a town, a Hundred miles from nowhere, and land up controlling the Senate, then kudos to him. The man is smarter than any one here attempting to belittle his achievements.. I spend my New Years there 50 years ago and it was just horrible..
Hey "Paha": no one takes him to task on it because they all do it...every senator or house rep who can parlay their position into $, does. What are you going to do about it?